Although I didn’t grow up eating macaroni and cheese, it’s a comfort food I discovered and fell for in college. I’ve since graduated from the blue boxes of neon orange elbows, but it’s something I still crave from time to time, and although I eat my fair share every time I make it, there are inevitably leftovers. Unfortunately, mac and cheese is one of those dishes that’s best when freshly made, and reheating it doesn’t do it any favors. That’s why I like upcycling leftovers into other dishes. 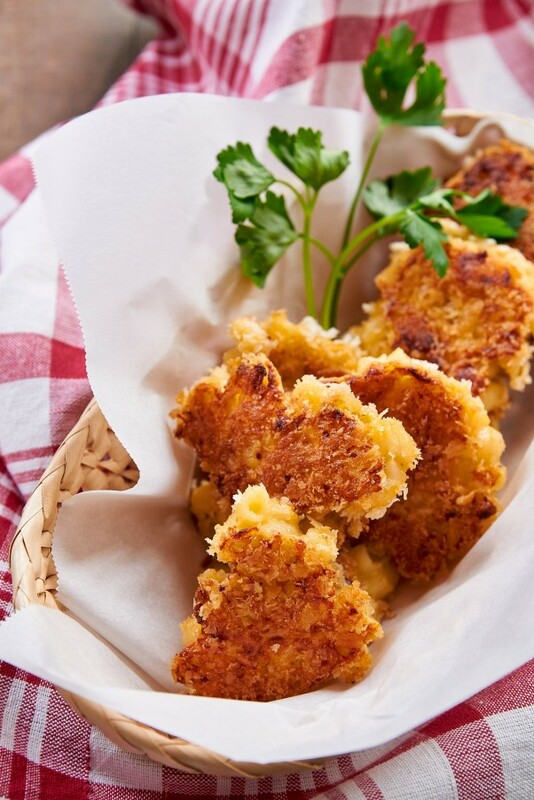 These easy pan-fried fritters are like two-bite grilled cheese sandwiches, with a crisp buttery crust and gooey mac and cheese in the center. I’m going to assume most of you know how to make macaroni and cheese, but in case you don’t, I have an easy stove-top macaroni and cheese recipe you can prepare for dinner the night before and save some leftovers to make these. One thing I recommend you do is to put your leftovers into a square or rectangular storage container and press it down enough so that there are no gaps between the individual elbows of macaroni. This ensures it sticks together into a cake. 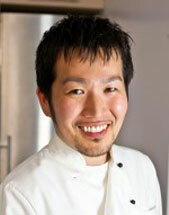 Once it’s refrigerated overnight, you should be able to unmold it and slice it. Then, it’s just a matter of coating each slice of macaroni and cheese with egg and breadcrumbs before pan-frying them in butter. 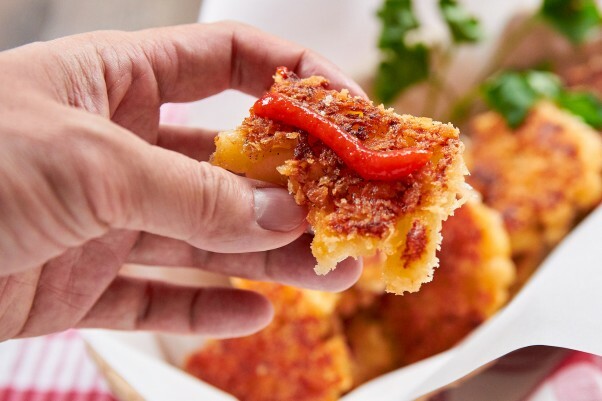 I like using panko for the breading, as the bigger crumbs make for a thicker layer of crisp buttery bread, but it will also work with regular breadcrumbs. I don’t think I need to tell you how delicious these are, but they’re even better with condiments. Whether you top them with ketchup, whole grain mustard, sriracha, or a simple squeeze of lemon, having a few condiments on hand takes each bite to new heights. Line a cooling rack with several layers of paper towels. 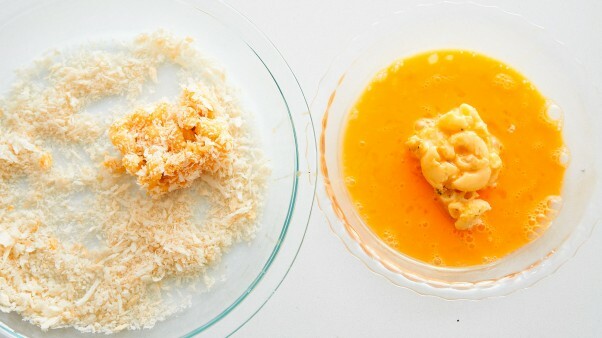 Prepare two shallow bowls, one with a beaten egg, and one with panko. 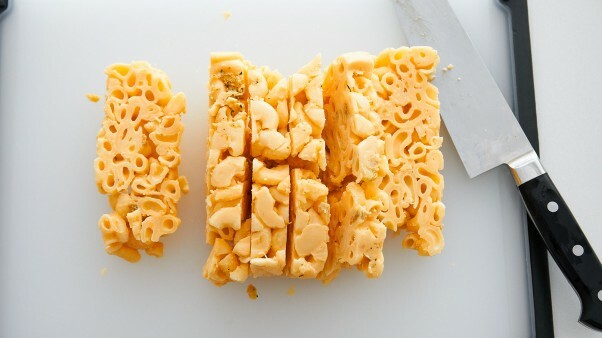 Unmold your leftover macaroni and slice it into 1/2-inch thick slices. Salt and pepper the slices of macaroni and cheese if you like. 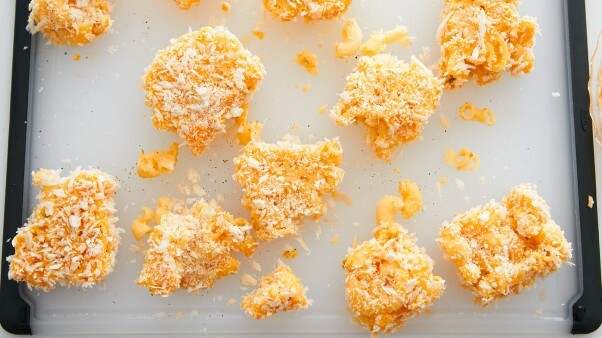 Dip each slice in egg and then in the panko, being careful not to break the pieces up. Add the butter (or oil) in a frying pan and heat over medium heat. 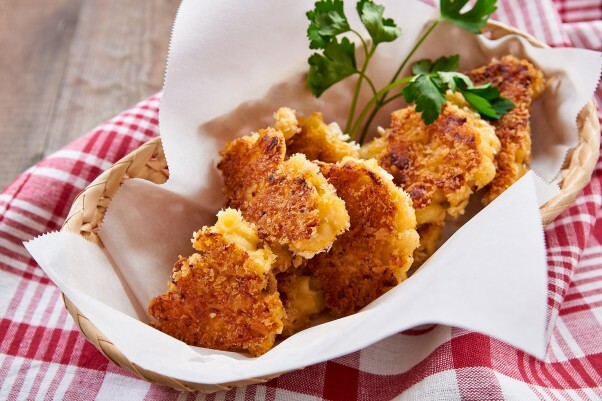 Swirl the butter around the pan and when it stops sizzling, add the slices of breaded mac and cheese. 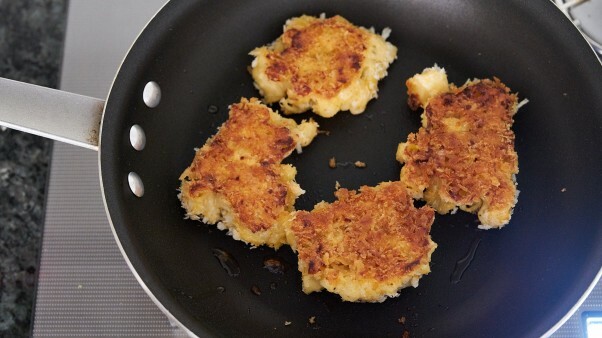 Fry until golden brown on one side and then flip and fry until golden brown on the other. Transfer to the paper towel-lined rack. Serve immediately with condiments of your choice.